Educated at the University of Wisconsin and at Harvard, Africa's first female President served as Liberia's Minister of Finance in the late 1970s. But when Samuel Doe seized power in a military coup in 1980 and executed the President and several Cabinet members, Ellen Johnson Sirleaf fled to Kenya, where she became a director at Citibank. She returned to contest the 1996 presidential election and lost to Charles Taylor. In 2005, she ran again and won, promising to bring motherly sensitivity and emotion to the presidency  a tall order in a country still reeling from years of civil war. 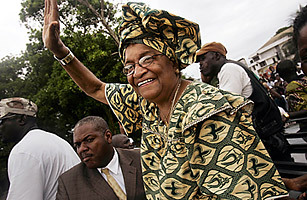 See a TIME video with Johnson Sirleaf.